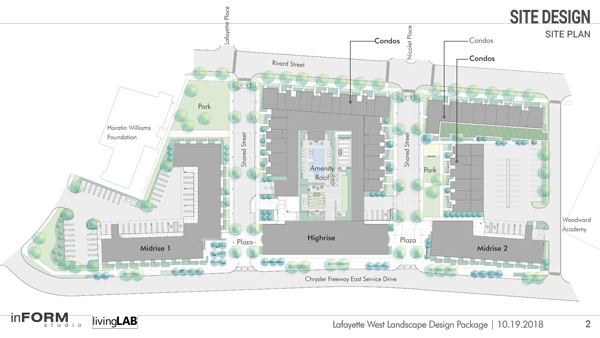 Ginosko Development Co. in Novi today announced it has received approval from the Neighborhood Advisory Council (NAC) and the Detroit City Council for its Lafayette West project in Lafayette Park east of downtown Detroit. The $108 million, 5.2-acre development, to be located north of East Lafayette between the I-375 Service Drive and Rivard Street (north of the Woodward Academy), was announced earlier this year. The project will offer 374 new residential units — including for-rent and for-sale lofts, townhouses, flats, high-rise units, and retail offerings. The project received a unanimous vote of approval from the project’s NAC, established by Detroit’s Community Benefits Ordinance (CBO) process. The ordinance requires developers whose projects exceed $75 million to engage with a NAC to identify potential negative impacts of the project and work together to resolve those matters in a way that strengthens the community. The development will also feature green space amenities and a walkable environment within walking or biking distance of the downtown area, major employment, recreation, and neighborhood shopping. It is projected to be completed in late 2020. The project was one of the first development to successfully undergo Detroit’s Community Benefits Ordinance process. “With the Lafayette West NAC, we were lucky to have an excellent group of neighbors with a nice cross section of experience, backgrounds and perspectives. We also had a developer who was genuinely engaged in the process and willing to make changes to address our feedback,” says Matt Morin, a NAC member. For more information, visit www.ginosko.com. Next articleDenso in Southfield Acquires All Assets of Automotive Diagnostics Supplier Ease Simulation Inc.